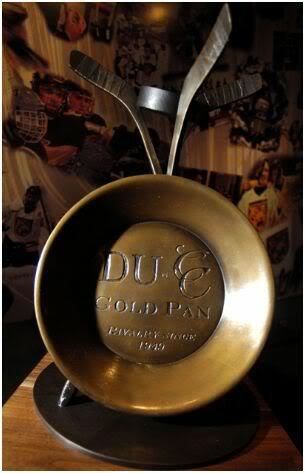 While the University of Denver and Colorado College started playing each other in January 1950, the Gold Pan Trophy was not created until the early nineties. DU Coach, Frank Sarratore (now coach of Air Force) and CC Coach Don Lucia (now coach of Minnesota) created the traveling trophy to be awarded to the winner of the regular season series. The first Gold Pan Trophy was an old mining pan from Cripple Creek, Colorado that actually was once used for prospecting. After the 2003-2004 season, DU lost that pan. The current trophy, replacing the 'lost' pan, was created by Colorado sculptor Mike Halterman and donated by the Cripple Creek & Victor Gold Mine in 2005. Both schools have remained in the same conference over the past 65 years and play four times each year during the regular season and have met in league and NCAA playoffs as well. The teams have met 297 times and DU leads the series 164-116-17. Despite the lopsided series figures, CC shockingly leads possession of the Gold Pan 12-10. CC always gets up to play in this series regardless of record so DU needs to get ready for a competitive weekend of hockey. DU better be ready to go this weekend. CC won't stay winless forever, and DU needs to come out and step on the throat from the opening shift. In the early 80s when the WCHA was a six team league, DU and CC played six times a year!